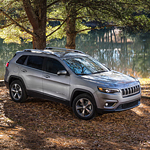 If you've been looking for a vehicle that is built to last on the inside and the outside, look no further than the new version of the Jeep Cherokee. Jeep has long been known for creating vehicles that withstand a variety of road conditions and surfaces. The Cherokee is comfortable thanks to Nappa Leather seating. That doesn't mean it's not a strong interior. The ventilated seats are practical and the contrast stitching gives the vehicle a very sporty look. When it comes to technology, you'll easily be able to enjoy a 8.4-inch touchscreen and Navigation system. Voice command features let you keep your eyes on the road and your hands on the wheel. Not just to be used for phone calls, your voice commands work if you want to play a specific tune while you are focusing on your drive.